When a baby is in a breech presentation, a vaginal delivery is more likely to result in injury and death than a C-section delivery. In a recent study, researchers found that the likelihood of dying was ten times higher for breech babies delivered vaginally than for those who were delivered by C-section. The study examined more than 58,000 cases of women who gave birth in the Netherlands to a baby in breech position between 1999 and 2007. A breech presentation is when the legs or buttocks of the baby are positioned to descend the birth canal first. There are 4 different breech positions. are flexed at the hip and extended at the knees, with the feet near the ears. Complete breech: In this position, the baby’s hips and knees are flexed so that the baby is sitting cross-legged, with feet beside the buttocks. Footling breech: In footling position, one or both feet come first, with the buttocks at a higher position than the feet. Kneeling breech: This is when the baby has one or both legs extended at the hips and flexed at the knees. When a baby is in a breech position, labor can be prolonged because physicians usually try to manually maneuver the baby into the normal, head-first position. This is done by pushing the baby into place from outside the mother’s abdomen. Prolonged labor puts a baby at risk of suffering oxygen deprivation and hypoxic-ischemic encephalopathy (HIE). If a baby cannot be maneuvered into head-first position, vaginal delivery should only be attempted if the baby is in the frank breech position and the following conditions are met. The baby’s heart rate is being closely monitored and the baby is not in distress. Cephalopelvic disproportion (CPD) is not present; x-rays and ultrasound show that the size of the mother’s pelvis will allow a safe vaginal birth. The hospital is equipped for and the physician is skilled in performing an emergency C-section. If these conditions are not present, vaginal birth should not be attempted. In fact, most experts recommend C-section delivery when the baby is in breech presentation because it is the safest method of delivery and it helps avoid birth injuries. Umbilical cord prolapse or compression: This is an emergency situation that occurs when the baby’s cord becomes compressed as the baby’s body descends through the birth canal. This can partially or completely cut off the supply of oxygen-rich blood going to the baby. A baby with a compressed cord must be delivered immediately in order to prevent brain damage caused by oxygen deprivation and hypoxic-ischemic encephalopathy (HIE). Nuchal cord: This is when the cord is wrapped around the baby’s neck. Nuchal cord is also an emergency because the knots that occur with this condition can partially or completely occlude the flow of blood from the umbilical cord to the baby. In addition, the cord can put so much pressure on the baby’s neck that blood flow to the baby’s brain is significantly decreased. This lack of oxygen to the brain puts the baby at significant risk of HIE and permanent brain damage. Fetal distress: Sometimes the forces and pressure of a difficult labor cause the baby to be deprived of oxygen and in distress. 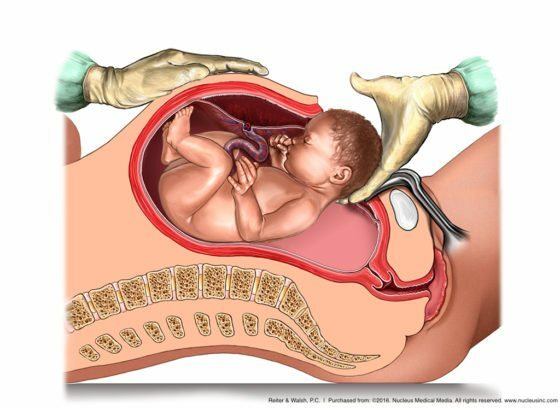 When fetal distress occurs, the baby must be delivered immediately by C-section in order to prevent conditions such as HIE and cerebral palsy. Traumatic injury: Injury to the brain or skull may occur during the passage of the baby’s head through the birth canal, or the spine or spinal cord may become injured due to improper positioning of the baby by the physician. Furthermore, attempts to position the baby can damage internal organs, or the brain may bleed, which can cause oxygen deprivation. The head may also get caught in the birth canal, and this can cause brain bleeds and hemorrhages. All of these conditions can cause HIE and cerebral palsy. Forceps injury: Sometimes forceps are used to assist in delivery of the baby’s head. There are many injuries associated with this risky delivery instrument, which resembles a pair of salad tongs. Improper placement of the forceps can cause compression of the head, spinal cord injury, tearing of the vasculature in the brain, and brain bleeds and hemorrhages. The brain can swell, which can lead to seizures and ischemia. All of these conditions can deprive the brain of oxygen and cause HIE and cerebral palsy. It is imperative for physicians to properly evaluate a mother and baby in order to be aware of a breech position. Continuous fetal heart rate monitoring is essential so that physicians know when a baby is in distress. Standards of care for delivery must be followed, and the hospital and physician must be prepared for a delivery by emergency C-section in order to avoid oxygen deprivation, hypoxic-ischemic encephalopathy (HIE) and cerebral palsy. If your child was diagnosed with a birth injury, such as cerebral palsy, a seizure disorder or hypoxic-ischemic encephalopathy (HIE), the award-winning birth injury lawyers at ABC Law Centers can help. We have helped children throughout the country obtain compensation for lifelong treatment, therapy, and a secure future, and we give personal attention to each child and family we represent. Our nationally recognized birth injury firm has numerous multi-million dollar verdicts and settlements that attest to our success and no fees are ever paid to our firm until we win your case. Email or call Reiter & Walsh ABC Law Centers at 888-419-2229 for a free case evaluation. Our firm’s award-winning lawyers are available 24 / 7 to speak with you.